The purpose of this Guide is to support the stone carver in the selection of carving stones based upon the hardness of the stone being carved. Soapstone is the softest of carving stones, followed by alabaster; marble and granite, are the hardest and typically carved by professionals. Within each type of carving stone there are varying degrees of hardness. This Guide addresses the most popular stones for carving among both beginner and advanced carvers: soapstone and alabaster. The stones provided here by Sculpture House have been grouped in classes from the softest to the hardest. This document is best viewed as a printed or downloaded document. Please note, the images of the stones in this Guide show them having been finished/polished on one side. The other side is the stone in its raw state. The stone you would receive is unfinished and would vary according to your finishing techniques. In addition, the shapes of individual stones, which are cut by hand, may vary. 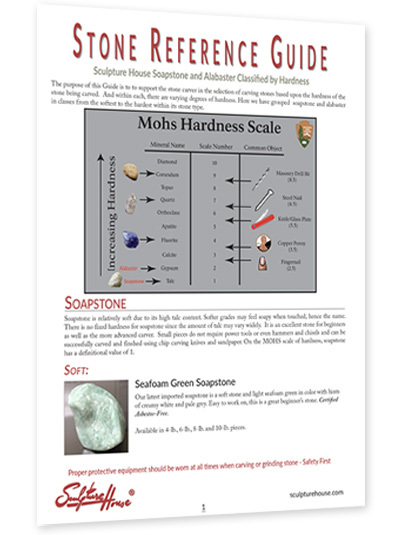 And finally, the colors of the stone you receive with your order may vary from the colors of the sample stone on your screen and/or in this Guide. The stone pictured is not the stone you would receive.